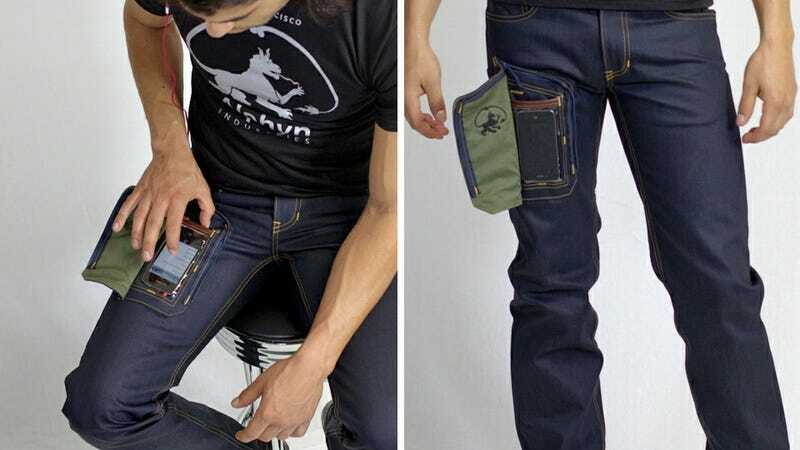 Humanity sadly takes a collective step backwards with Alphyn Industries' new DELTA415 Wearcom jeans that feature a zippered pocket with a see-through pouch for accessing your smartphone without having to remove it first. We've already addressed the issue of bigger and bigger smartphones being harder and harder to carry in a pair of skinny jeans. But this? This isn't the solution to that problem. In fact, this isn't the solution to anything—besides a sub-conscious need you might have of looking like a complete tool. Supposedly inspired by the pockets on a fighter pilot's G-suit, these $160 jeans are completely lacking everything cool about fighter planes that lets a pilot get away with such a fashion faux-pas. Even a top gun couldn't get away with wearing these as civilian attire, so take our advice and don't even try to pull them off.